Ad Hoc Timber Harvesting Committees most recent ACTIVITY please click here. Ad Hoc Timber Harvesting Committees DOCUMENTS please click here. 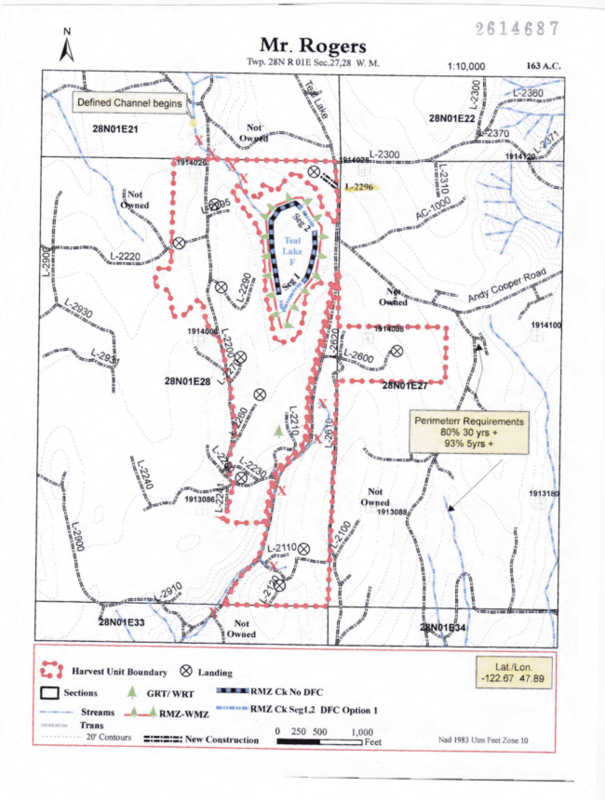 Olympic Resource Management (ORM) has received a permit from the Washington Department of Natural Resources (DNR) to harvest 163 acres in four parcels around Teal Lake. The parcels are outside the Master Planned Resort and south of Olympic Terrace. This harvest is called the Mr. Rogers cut and will commence in the next month. A map showing the area to be harvested is attached. Some of Port Ludlow’s Trails will be closed during the harvesting. Representatives of both Jefferson County and Port Ludlow Associates (PLA) will be in attendance to explain what is in the Settlement Agreement and answer questions about how it will be implemented. The PLVC invites all members of the Port Ludlow community to attend this informational meeting to be held on Wednesday, January 25, at 10 a.m. in the Bay Club. Here are links to a copy of the settlement agreement [link] and to the county’s press release about the settlement [link].